Fortuna can be quite a joker sometimes. And the morning of November 9, 2016 when America ended up with a President whom not many seem to be very fond of was the latest perfect manifestation of her twisted sense of humor and the proverbial randomness she spins her wheel with. The election of Donald Trump as the 45th President of the United States was and is seen by many as a big threat to American democracy, a challenge to principles the nation adopted long ago and according to which it has been trying to run its politics ever since. And while President Trump is seen as America’s new supervillain by the media and the public, the once successful casino tycoon turned the country’s highest official has become bookies’ newest sweetheart. 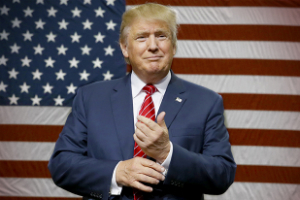 His rather chaotic approaches and decisions during his presidential campaign and the first several weeks of his tenure have come as a blessing to gambling operators. Being the opportunistic enterprises we all know them to be, they have certainly taken good advantage of the current state of affairs. Bookies, and one particular bookie we all know for its wittiness, are now accepting bets on Trump-related bits and pieces and whatnots. 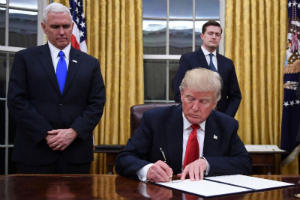 And given the fact that Mr. Trump’s first days of presidency have been rich in events, bettors from all around the world may rest assured that they will be offered various and rather extravagant options to wager their money on. Looking for the brightest examples of the Trump Specials madness is very much like going through Encyclopaedia Britannica and trying to list its best entries out of so many. However, we have picked several to have stricken us as ones worth sharing. Two Presidents have been successfully impeached in the US history (and contrary to popular belief, Richard Nixon was not one of them). Many believe that Donald Trump will be the third US President to be removed from office. Bearing in mind the instances of vilification of immigrants, minorities, women, and other groups of society that can be given as well as his promises for rather illiberal legislative changes can certainly help us imagine a possible scenario in which he is impeached. And here come the Trump Specials on his impeachment. According to Irish gambling operator Paddy Power, there is a massive 80% chance that President Trump will be impeached before the end of his first year of tenure. Its UK rival Ladbrokes has placed the odds at 11/10 for him to leave his post or be removed by the end of his first term. It is part of every high official’s job to travel around the world and meet with other high officials, and hopefully spend time to solve some of the world’s problems. However, President Trump’s outspokenness has turned him into a very unwelcome guest. 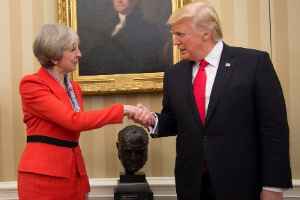 America’s newly sworn-in President welcomed UK Prime Minister Theresa May as his first official guest. Mr. Trump, however, may not be returned the hospitality very soon as British MPs have spoken vocally against a potential visit from the US. His traveling adventures and trials have, too, been spotted by bookies. For instance, Paddy Power, the operator that tends to initiate rather bizarre betting promotions, now accepts bets on the first country to be visited by President Trump. Although America’s top official has openly been accused of ties with Russia, odds for a him to pay a visit to his Russian colleague, Vladimir Putin, stand at 7/1. Slovenia has been listed as the likely choice for President Trump’s first foreign trip. This probably stems from the fact that the First Lady of the United States was born and raised in the tiny European country. President Trump likes to ban things, this can be said for sure. Three weeks into office and he has banned people from seven Muslim-majority countries from entering the US. 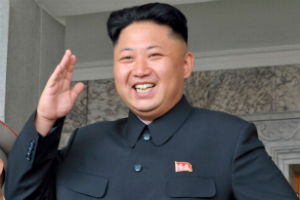 Many believe that more travel bans will follow and odds suggest that North Korea is the most popular option. Mr. Trump and North Korea’s Supreme Leader Kim Jong-un have something in common – their rather extravagant political approaches have won them a reputation of outcasts. However, the US President has shared the popular opinion just for this once and has condemned the latest North Korea missile launch. If we can pick up one genuinely good thing about Mr. Trump’s Presidency, this would be the fact that we will certainly be seeing more of Ivanka Trump’s set of perfectly sculpted legs. So, a longer Trump Presidency may not be such a bad thing after all. President Trump’s eldest daughter may have inherited her good looks from her mother, Ivana Zelníčková, but her entrepreneurial muscle can be attributed to her daddy. However, Trump is not the best family name to have attached to you these days and the First Daughter has already understood this. A number of popular brands have dropped her products in the days and weeks after her father was elected and sworn into office and the trend will likely be maintained. For that reason, bettors were also kindly provided with the chance to wager on the next brand to ditch Ivana Trump goods. Retail chain T.K. Maxx was the most popular choice and indeed the company went under wraps with the First Daughter a few days ago. Although leaked audio of Mr. Trump engaging in a lewd conversation about women has turned him into a walking voodoo doll for feminists from all around the world, to many America’s new President is a loving husband and father. However, Paddy Power has suggested that all the emotional strain that comes with being a member of the First Family of the United States may be too much for the Trumps. 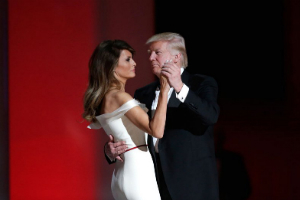 The bookmaker accepts bets that news about the end of Donald and Melania Trump’s marriage may emerge before the end of the year.